Reports from accident survivors | Performance / effect test data | motorcycle | - hit-air - Werable Airbag | Mugen Denko Co., Ltd.
"I am riding a motorcycle again." 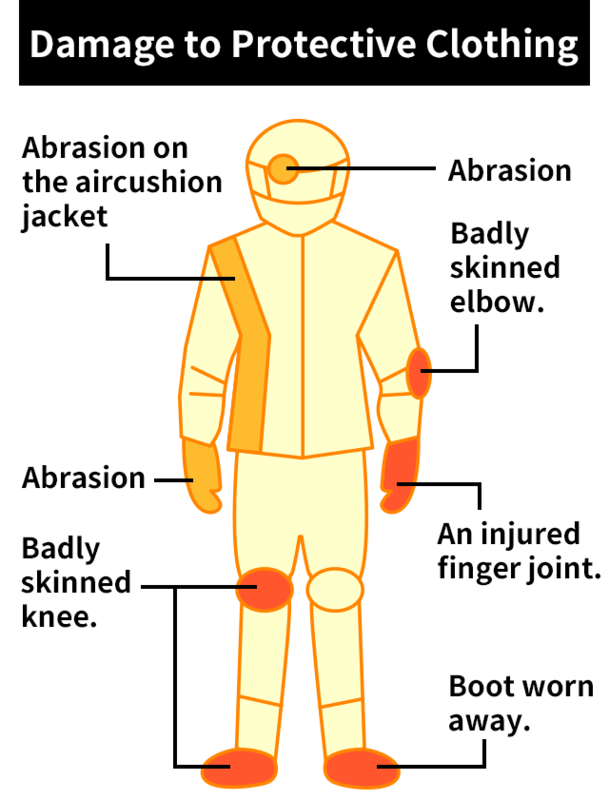 Quite a number of cases have been reported by riders who were wearing an Eggparka Jacket at the time of an accident and who claim that it saved their lives. The EGGPARKA is the predecessor of the "Hit Air" Jacket and shares a common safety system. I have been riding scooters since I was a schoolboy - for about 35 years. They are convenient, but what I am afraid of is the possibility of falling down. 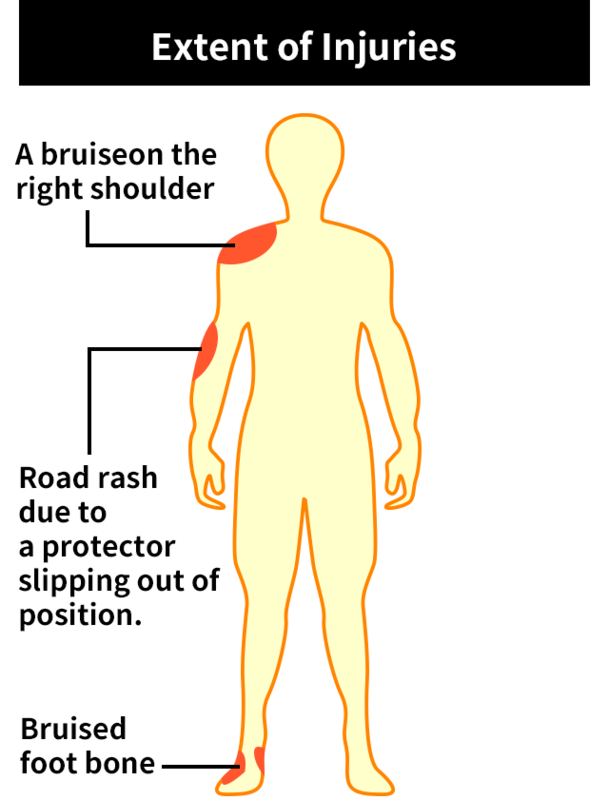 Even if I am careful, sometimes an accident may happen on a wet or frozen road or on a sandy road. So as soon as I saw a motorcycle airbag, I bought one. 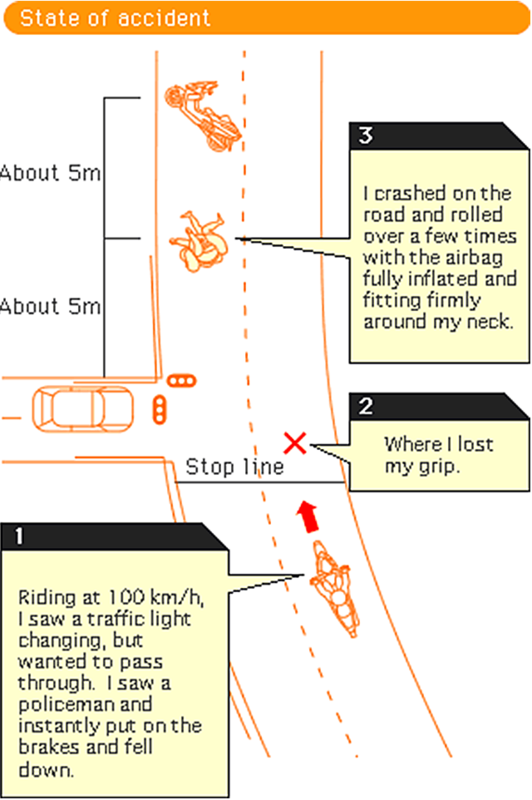 About one year later, on a Sunday afternoon, rounding a curve near my home, a car stopped abruptly in front of me and I had scarcely put on the brake when I was thrown off the scooter . I commute 27.5 km every day on a Suzuki Skywave 250 and had an accident but suffered only a slight injury because I wore an Eggparka. A policeman watching my accident by chance was impressed by the effectiveness of the Eggparka. The speed was about 100 km per hour and it inflated fully while I was in the air and no shock was felt on the neck, body and head. After landing, the upper half of my body was facing upward and I felt that I was sliding on the soft mat. Without the Eggparka, I have no doubt that I would have suffered a fatal wound and I am very grateful.